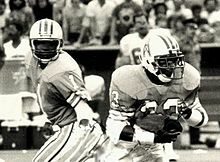 The Oilers competed in the East Division (along with Buffalo, New York and Boston) of the AFL before the merger, after which they joined the newly formed AFC Central. The Oilers throughout their existence were owned by Bud Adams and played their home games at the Astrodome for the majority of their time in Houston ( Jeppesen Stadium and Rice Stadium hosted the Oilers for their first eight years). The Oilers appeared in the first three AFL championships. They scored an important victory over the NFL when they signed LSU's Heisman Trophy winner, All-America running back Billy Cannon. 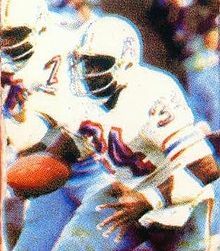 Cannon joined other Oiler offensive stars such as quarterback George Blanda, flanker Charlie Hennigan, running back Charlie Tolar, and guard Bob Talamini. After winning the first-ever AFL championship over the Los Angeles Chargers in 1960, they repeated over the same team (then in San Diego) in 1961. (In 2012, the retail outlet Old Navy earned infamy for selling a shirt that misidentified the 1961 AFL champions as the Houston Texans, who did not exist until 2002.) They lost to the Dallas Texans in the classic 1962 double-overtime AFL championship game, at the time the longest professional football championship game ever played. In 1962, the Oilers were the first AFL team to sign an active NFL player away from the other league, when wide receiver Willard Dewveall left the Bears to join the champion Oilers. Dewveall that year caught the longest pass reception for a touchdown in professional American football history, 99 yards, from Jacky Lee, against the San Diego Chargers. The years immediately after the AFL-NFL Merger were not as kind to the Oilers, who sank to the bottom of the AFC Central division. After going 3–10–1 in 1970, they went 4–9–1 in 1971, and then suffered back-to-back 1–13 seasons in 1972– 73. But by 1974, the Oilers led by Hall of Fame coach Sid Gillman brought the team back to respectability by reaching .500 at season's end. The Oilers briefly rose to become a league power once again in the first half of the 1990s. In 1991, the Oilers won their first division title in 25 years, and their first as an NFL team. However, only two minutes away from their first conference title game in 13 years, they were the victims of an 80-yard march by John Elway and the Denver Broncos before David Treadwell kicked a 28-yard field goal to win the game 26–24. In 1992, the Oilers compiled a 10–6 regular season record, but made history against the Buffalo Bills in the AFC Wild Card playoffs by blowing an NFL record 35–3 lead and eventually losing 41–38 in overtime, a game now known simply as " The Comeback". At the same time, Adams again lobbied the city for a new stadium, one with club seating and other revenue generators present in recently–built NFL stadiums, and he committed to pay for 25% of the cost of a new stadium. His idea called for a downtown domed stadium that could also be reconfigured to accommodate the NBA's Houston Rockets–similar to San Antonio's Alamodome. Mayor Bob Lanier initially supported Adams' bid for a new stadium privately, but refused to publicly support the project. Although Houstonians wanted to keep the Oilers, they were leery of investing more money on a stadium so soon after the Astrodome improvements. The city was also still struggling to recover from the oil collapse of the 1980s. Adams, sensing that he was not going to get the stadium he wanted, began shopping the Oilers to other cities. He was particularly intrigued by Nashville, and opened secret talks with mayor Phil Bredesen. At the end of the 1995 season, Adams announced that the Oilers would be moving to Nashville for the 1998 season. City officials there promised to contribute $144 million toward a new stadium, as well as $70 million in ticket sales.